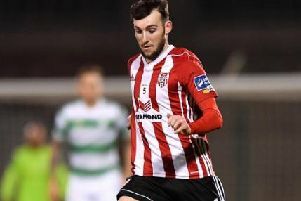 Derry City returned to winning ways, thanks to a deserved 3-2 win over Waterford. Midfielder Ciaron Harkin scored his first goal for his home town club with superb 20 yard strike. Derry City's Ciaron Harkin celebrates. The visitors levelled things from the penalty spot on the hour mark as Shane Duggan fired home, before Derry netted twice in fortunate circumstances. Firstly Patrick McClean's left wing cross was turned into his own net by defender Rory Feely. Then on 84 minutes Harkin's right wing cross, which was fizzed into the six yard box, saw substitute Georgie Poynton, like Feely, divert the ball into his own net. The goal of the night came on 88 minutes as Cory Galvin, saw his 25 yard strike whistle into the net, giving City keeper Peter Cherrie no chance.